Now that marigolds have done their job of protection in the vegetable garden, it is time to cut them and bring them indoors to add their awesome shades of orange and gold to your autumn decor. Arranged in a glazed pot decorated with maple leaves, these unassuming cheerful flowers will bring a spicy scent of summer and a burst of sunshine into your home or business. Set on a simple table, the arrangement can also be used for remembrance during All Saints’ Day, All Souls’ Day and Día de los Muertos, which will be celebrated in about 10 days time. 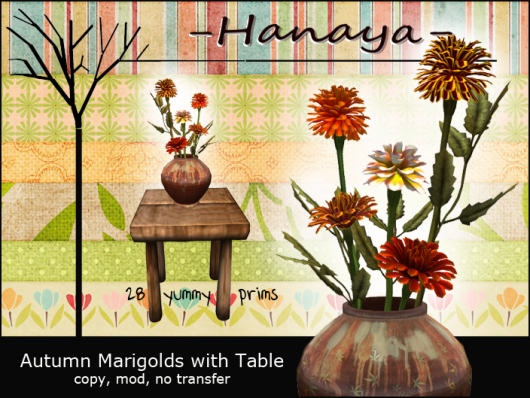 The -Hanaya- Autumn Marigolds with Table are now available for purchase both at our in-world store, as well as on the Second Life Marketplace. This entry was posted in Product Announcements on October 23, 2011 by moriko. 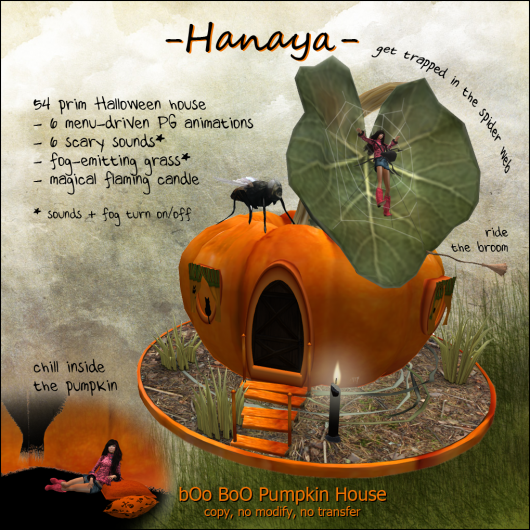 -Hanaya- is participating in the Boo-tiful Disaster Gridwide Hunt, which starts on Saturday, October 22nd. We welcome the opportunity to give away a fun Halloweeny creation, which was made especially for this hunt. The -Hanaya- Scary Urban Photo Scene can be used as a stand-alone decoration, or as a photo prop for all our awesome bloggers out there. What can you expect to see when you unpack our gift? You will find a fully sculpted urban street scene, complete with a garbage can fire, broken cinder-brick walls and cracked pavement, which has tufts of grass growing through it. Scattered about are a bunch of pumpkins (of course), and a creepy sticky spider web and spider hangs in the corner. Our famous waving ghosts (yeah they really wave) are paired up with more pumpkins on a string to light the scene for you. The set also contains 3 menu-driven PG animations – one in the spider, and two in the pumpkins. More information about the hunt is available on the Greatest Love hunt blog. The hunt runs from October 22 to November 5, 2011. Our store is # 108 and the hint is ‘Nevermore’. This entry was posted in Events, Freebies and Gifts, Product Announcements on October 21, 2011 by moriko. 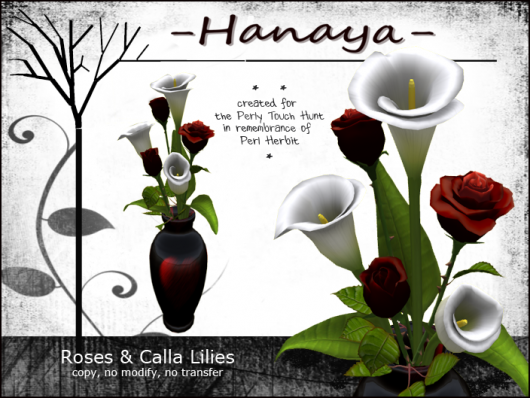 If you have time over the next month, please stop by our in-world store and pick up your copy of the -Hanaya- Roses & Calla Lilies, which is a hunt gift for the Perly Touch Hunt. The hunt, organized by friends of Perl Herbit (Bovarro), is an event to remember Perl, who passed away in July of this year. Perl was an awesome hunt organizer and having a hunt in her honour seems like a perfect way to remember her. I only knew her for a short while, and not very well at that, but I do know that she loved flowers. The hunt starts today, October 15th and runs until November 15, 2011. This entry was posted in Events, Freebies and Gifts, Product Announcements on October 15, 2011 by moriko. 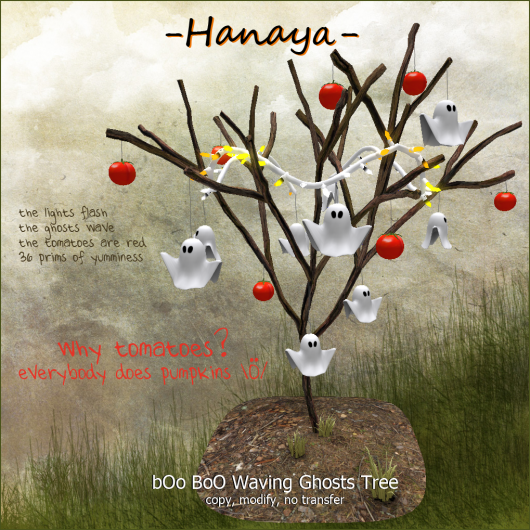 If these thoughts create a picture in your mind’s eye, then you may be seeing what I saw when was working on creating the -Hanaya- Halloween items for the FTLO Boo-for-2 Event. The Waving Ghosts Tree is modeled after a real life tree that my daughter and I used to decorate with tissue paper ghosts that used to sway in the wind. Anyway, the ghosties are scripted to wave at you and the whole yummy tree is topped with a string of flashing Halloween lights to add a special touch to your outdoor spaces. It comes complete with an autumn-coloured base with sculpted grass tufts and looks great from all sides. If you want to see it rezzed out, please pop by our in-world store. Available for purchase (100 L) at the FTLO Boo-for-2 Event. We also added a teeny garden complete with fog-emitting* sculpted grass clumps, a flickering magical black candle, and rickety steps leading to your front door. And of course a spider net with a scaaaary spider, and the fly that go away and got very very very large! So please come and check out the fun at the FTLO Boo-for-2 Event, which starts on October 10th and continues until October 31st. * Click grass for fog, and candle for sound on/off (sound is owner-operated). Background image for 2 vendor posters in this post created by rubyblossom. This entry was posted in Events, Freebies and Gifts, Product Announcements on October 9, 2011 by moriko. 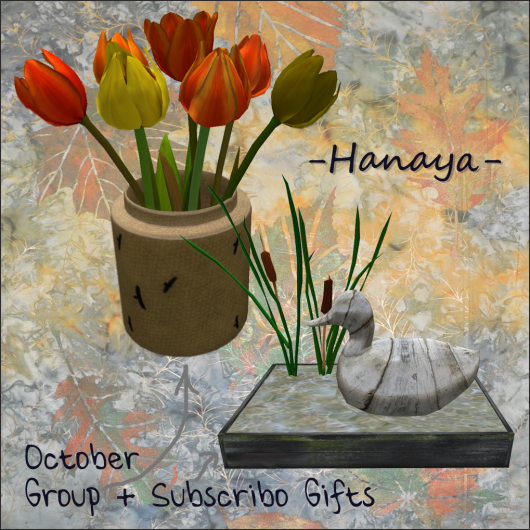 -Hanaya- October Group and Subscribo gifts have now been sent out. If you missed it, please join the in-world group to get both gifts. This entry was posted in Freebies and Gifts on October 2, 2011 by moriko. With cool evenings upon us, I wanted to change up my Second Life living room from it’s summer colours. I thought of what might make me want to stay inside and cuddle up on the couch – cushy pillows in earthy tones, a stack of books to read, and a place to put my feet up. And lots of places for my family and friends to hang out with me. So I created the -Hanaya- Harvest Fair Living Room Set. The couch and chairs seat up to 6 people at once, and contain 12 couple and 8 single avatar animations. A Vintage Duck Decoy book end holds up a stack of books – what will you read today? A harvest cornucopia overflowing with seasonal fruits, embellished with ivy sits on the coffee table, in case you need healthy munchies. A scrunchy rug completes the look, which is complemented by our ‘Cloudy Days’ wall art. A demo of the Harvest Fair Living Room is set up on the second floor of our in-world store. Please stop by to visit us and try it out if you have time! The set is also available in our webstore on the Second Life Marketplace. 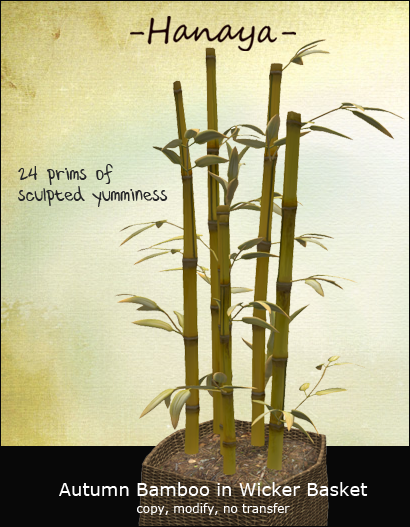 The cornucopia and bamboo are also sold separately, and are available in the new product area of our main store. Have a wonderful weekend, and enjoy the first days of October! This entry was posted in Product Announcements on October 1, 2011 by moriko.